Stampede Automotive Accessories top of the line deflectors are designed and manufactured to expedite airflow through the cab while protecting you from the elements. 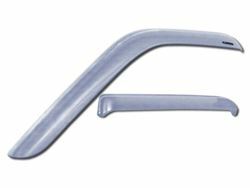 Contoured to fit, Stampede Automotive Accessories Tape-Onz Sidewind Deflectors are engineered to be an exact fit for each vehicles door style. Available in a variety of styles from Smoke, Chrome, Carbon Fiber or Camo; these vent visors offer the perfect blend of style and design. Tape-on vent visors are custom designed to fit the exact contours of your car, truck or SUV and installation is a breeze with the pre-installed 3M double stick tape that attach the visors securely to your vehicle. Even more, these Stampede side window deflectors are backed up by a 1 year warranty.